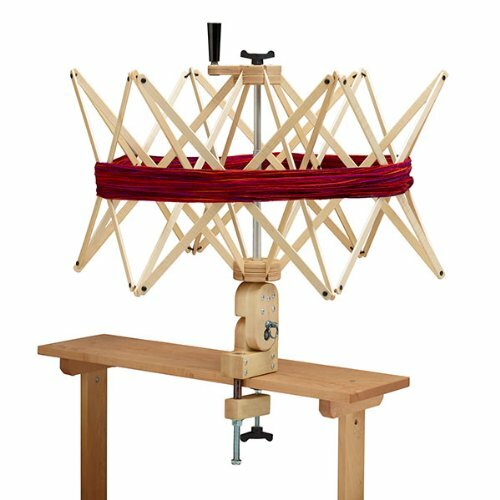 Have you always dreamed of a workhorse yarn swift that gets through anything you throw at it without breaking, wobbling, or scooting across a table? The Schacht Ultra Umbrella Swift may be the swift of your dreams. This yarn swift does it all in one convenient package. Are your tables thicker than normal? No problem as the clamp accommodates thick surfaces. Do you like to switch from a horizontal to a vertical rotation? No problem as it quickly converts to a different direction with a simple pull of a locking pin. Are you tired of reaching under ribs to tighten screws to set hank tension? No problem as it works from the top down. For half a century, Schacht Spindle Company has provided handcrafters with quality tools. Schacht’s attention to detail and innovative design gives them a reputation for making easy-to-use products that last. The Ultra Umbrella Swift lives up to Schacht’s reputation – it does exactly what you want it to do every time you use it. If you’re tired of swifts breaking after a few uses, making loud noises while spinning, or needing disassembling for storage, you’ll be happy to know that the Ultra Umbrella Swift does none of these. Even after months of daily winding, it spins quietly with ease, and quickly disassembles after use. One great feature of the Schacht Ultra Umbrella swift is how the ribs open for holding the hanks. The ribs open from the top down, which means you have more leverage to get the ribs into place because your back muscles help you push them down. You don’t have to reach or through the ribs to push up the umbrella ribs into position to hold the hank, this swift lets you simply push down on the ribs and tighten the black knob to lock them into position. If you have a higher table or you might be a wee bit vertically challenged like me, then moving the swift into a vertical position may make it easier to reach the top of the swift to push down the ribs. This swift combines the best of technology with natural wood. Metal provides strength in a strong central rod, screws, and pins. 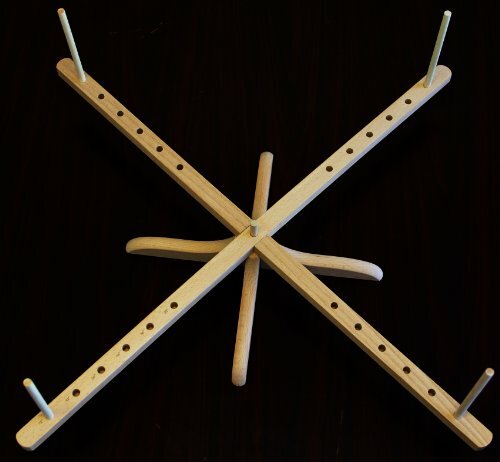 Wood provides lightweight flexibility and strength for the ribs and sturdiness for the base. Steel pins and plastic buttons hold the ribs in place – an improvement over the cotton cord and metal hooks used by other yarn swifts. A strong metal central rod eliminates wood on wood friction and the noise that you usually hear with all wooden swifts. The thicker metal rod helps to stabilize the swift when turning, which takes away the wobbliness of lighter weight swifts. 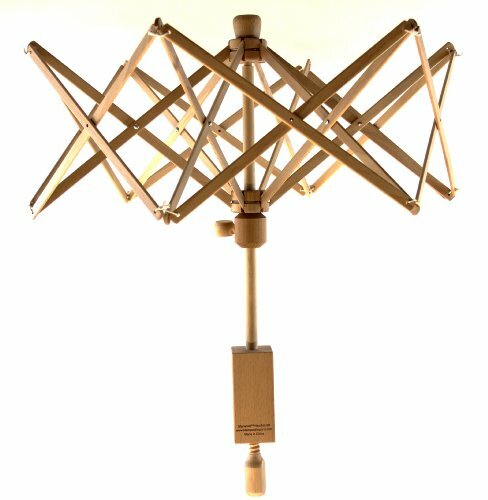 The Ultra Umbrella swift spins on ball bearings, eliminating the squeaking sounds all wooden swifts make. This swift also uses metal screws in the clamps which increases durability and minimizes breakage. Hank size: This swift accommodates hanks up to 93 inches in diameter. Storage space: The Ultra Umbrella swift quickly collapses for storage. Approximately 36 inches by 8 inches of storage would make an ideal area for this swift to recuperate from all your wound off hanks until your next project. Or better yet, leave this beauty out on your worktable for all to see. No need to worry about what yarn to wind as this swift has you covered from delicate gossamer to fat and sassy roving. Unlike many umbrella swifts that begin to collapse during the last few rotations when winding, the ribs of the Schacht umbrella swift stay in place until you decide to collapse them. If spinning gets you excited, consider if your swift should come with or without a handle. If you want to use your swift to create hanks or to reskein yarn cakes, the built-in handle crank helps you turn the swift at an even tension to make an even hank and to retain yarn elasticity. 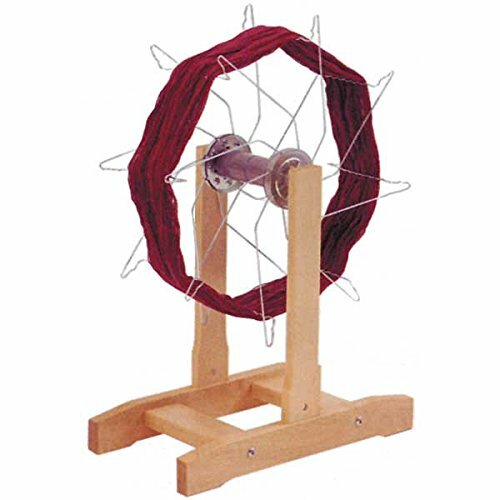 If you have a lot of left over yarn after a project, then use this swift to turn those cakes or balls back into hanks. With the optional yardage counter, the Schacht Umbrella swift can tell you how many yards you have left. With metal screws and a metal central rod, this swift holds up whatever you wind. Steel pins not only hold the ribs in place but also separate the ribs to keep them from rubbing together. This makes this product more durable. The natural wood ribs on this swift keep oil away from your yarns. The varnished base helps preserve the wood. At 5 pounds, this swift weighs a bit more than other umbrella swifts, but it more than makes up the difference in the quality and stability when in use. Excess moisture could harm the wood and the metal on this swift, but most people shouldn’t have a problem if they limit the swift to indoor use or outside use only on sunny days. This classy yarn swift meets the high expectations of users. 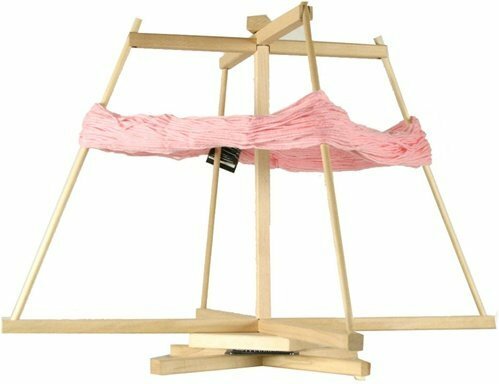 Smooth operation while spinning, changing hank sizes, rotating from vertical to horizontal, and ease of unwinding cakes make this yarn swift one appreciated by knitters. The locking pin on the base to converts this swift from horizontal to vertical in seconds by pulling out the pin. No need to reclamp the swift onto a chair as the base does the work for you by pivoting up and down. It's functional and lightweight, with no assembly required. What it lacks indurability and quality, it makes up for with its low price. 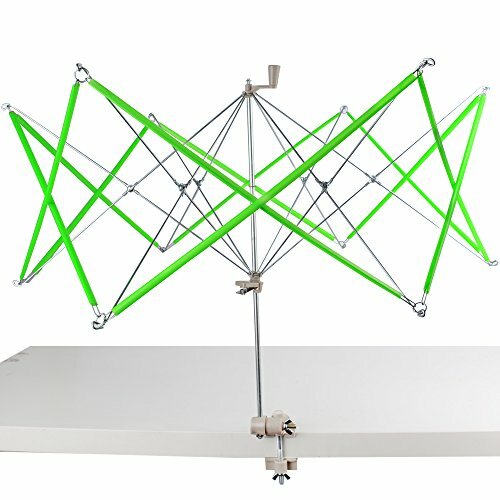 A good vertical winder that requires less space than an umbrella swift for use. Best for small to medium hank sizes or for unwinding cakes to hanks. An easy-to-use, all wooden swift. Works best with small-to-medium sized hanks. Old time style and simplicity that works for a wide range of hank sizes. The base can move across the table while winding, but you don't have to deal with any clamps or screws which can mar surfaces. All wood swift spins fast on ball bearings. No screws or clamps makes set-up quick and easy, but must be dissembled for storage.